I’m experiencing a plumbing crisis of epic proportions! Ok, perhaps I’m exaggerating a bit. My house isn’t completely flooded. There was a leak in a pipe in the wall of our powder room and it created quite a mess . I’m sure some of you homeowners out there understand the stress I am feeling right now. But, I shall not drown in my sorrows, nor drag you all down into a watery grave with me. Instead, I’m going to relieve my stress using some visualization techniques. I will visualize the remodel of my powder room. I will visualize it becoming a beautiful space. I will visualize myself powdering my nose while admiring the finishes and fixtures. Ahhh yes, the ideas are flowing in and the worries flowing out…. I would like my powder room to be larger. They aren’t meant to be large, I know. But I don’t think it’s too much to ask that it be more than a glorified closet. I would like any guest of mine to be able to enter and use the powder room comfortably. This powder room, for example, is not only beautiful, but the designer did everything right to make it feel roomy. 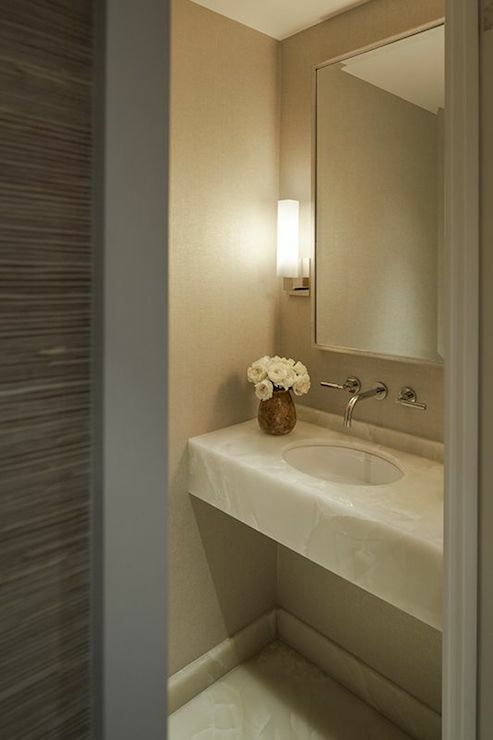 The light, neutral colors, and the open vanity add to the feeling of spaciousness. The crown molding and the lovely chandelier draw the eye up. 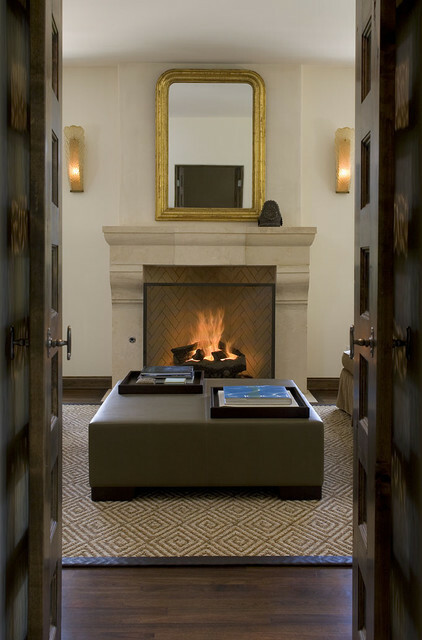 Finishes which catch and reflect light, add dimension to the space. Yes, I could definitely imagine my powder room looking like this. As you can see, the right vanity can make a big difference in a powder room. Open and floating vanities are perfect for helping a small space seem larger. While you may lose some storage space, you will gain aesthetic appeal. And you don’t generally need a lot of storage space in a powder room. Here are some examples of vanities I would be happy to call my own. Lighting makes a big difference in small rooms as well. 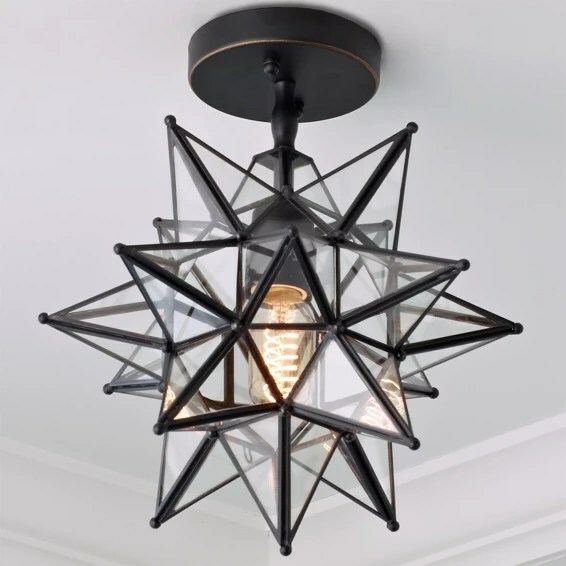 While I would love to have a nice chandelier in our powder room, the ceiling isn’t exactly soaring, and it wouldn’t do to have my guests bumping their heads on my light fixture. 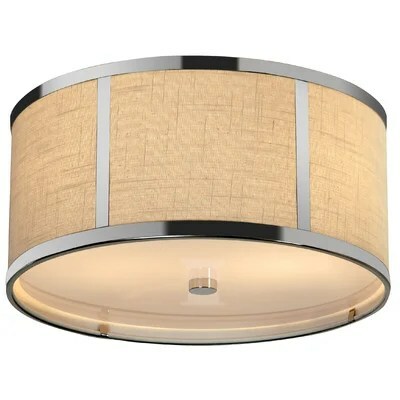 I would like to replace the cheap, ugly flush mount fixture we currently have. 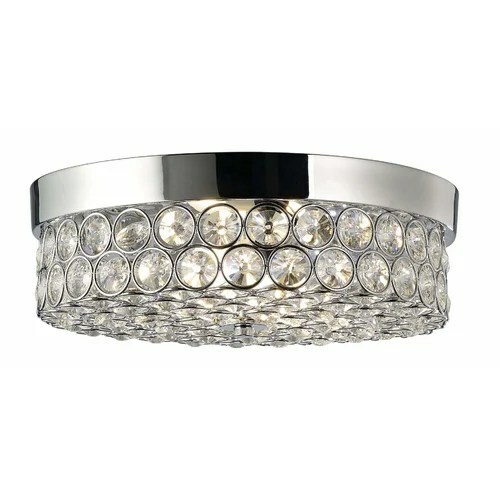 Any one of these these fixtures here would light up my life. Selecting the right paint color is another important factor when dealing with small rooms. Most people say it is wise to select a light, neutral color. And I would tend to agree. I am a partial to white, pale blues and grays, and tans. That being said however, I do believe rules are sometimes meant to be broken. Sometimes going dark in a small room creates drama and glamour. I wouldn’t object to this idea. Yes, this whole visualizing thing helped lessen the blow. And it has inspired me. While we can’t do a full on remodel of our powder room, we will have to take care of some repairs and replacements. And I’m going to do a little redecorating! I love the rain! I love the sound of it, the feel of it, and the smell of it. And we are finally getting some here in San Diego. Boy, have we been thirsty! Now, I know my photography skills aren’t mind-blowing and this room’s decor is ever evolving. But can you not appreciate the beauty of this fireplace? OK, perhaps it doesn’t warm your heart like it does mine. See, my husband created this work of interior poetry. 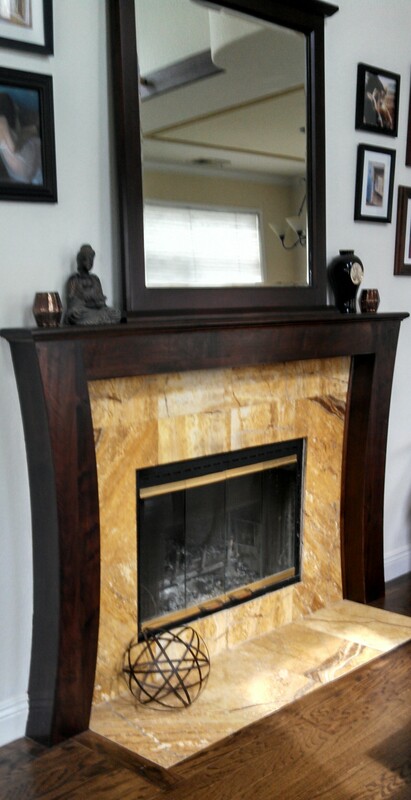 It was once the standard builder grade fireplace with boring beige tile and a tightrope mantle. So, inspired to create something new, I drew my idea for a mantle on a cocktail napkin. And my amazing, handy husband created it! The tile I had fallen in love with when I saw it in one of the flooring showrooms I worked in. I thought it would be perfect for our new and improved fireplace. And my husband installed it. Not only is it beautiful, it is a very personal touch, and that is what makes a house a home after all. Of course, I had looked through countless magazines and even purchased an idea book before I drew on that napkin. However, nothing I saw really spoke to me. So, I consulted my imagination. A more traditional style. Love those tiles! What about you? Is your fireplace on fire? Or are you burning for a new one? Happy New Year my fellow contemplators of beauty! My apologies for not writing sooner. Let’s pick up where we left off, shall we? Last time, I wrote about a very nice entryway. This time, I would like to share a living room that I would happily live in. Modern Living Room by Santa Barbara Architects & Designers Shubin + Donaldson Architects, Inc. I love nature in all its varied, colorful beauty. It is the ultimate form of art, the ultimate expression of beauty. And I appreciate designers and architects efforts to create homes and interiors which allow residents to experience such beauty, whether through expansive windows and doors or through materials which reference nature. This space almost feels as though it is not a space at all, as though no boundaries exist between interior and exterior. The eye is drawn to the absolutely stunning view of trees, ocean, and sky. That is ultimately the focal point, the living art. Just outside the living room are a patio and triangular extension of the pool, which not only mimics the blue of the ocean, but seems to point at it, drawing the viewer out and beyond. The wall of windows and sliding glass doors allow this amazing view. The beautiful Eucalyptus veneer plywood ceiling is carried through to the exterior, and its light color and linearity also draw the eye up and out. The plywood ceiling and mahogany wood framing add a warm, natural feel and contrast nicely with the grey concrete walls. The concrete walls, just like the ceiling, are carried through to the exterior, again connecting the indoors with the outdoors, and drawing attention to the magnificent view. Because the grey acts as a neutral, the walls seem to recede, adding to the voluminous feeling of the room. Of course, I can’t ignore the furnishings. And these furnishings are perfect for this space. The modern glass coffee table reflects the sunlight and clouds. Although the two chairs seem large, they appear to be covered in a mesh material, and have slender legs. The table between the chairs has a square wooden top, but slim legs. These pieces, while not being solid or chunky, are not dainty or small. They have presence and hold their own in this spacious room, but they don’t block the light or view. The sofa, chair, and ottoman are larger in scale, well suited for this sizable room. Their neutral tan color and subtle texture give them a sense of refined yet casual comfort. One can’t ignore that intricately carved wooden chair. It is absolutely a piece of art! Its shape is reminiscent of gnarled, ancient tree branches. I would venture to guess it is an antique, something the owner has collected, but that doesn’t mean it doesn’t fit well in this modern space. It adds contrast, it creates visual rhythm with the two side tables and the window and door trim, and its solid structure is in harmony with the architecture of the space. Not only is the rug the right size for the space, but the floral pattern is the right scale as well. Again, we get the reference to nature. The tan, grey, and black coordinate with the other finishes in the room, while the occasional pop of red adds visual interest and coordinates with the wood furnishings and trim. I am a fan of that lamp. It is tall, yet the legs are slim and the shade is wide, yet neutral. Again, it doesn’t block the view, yet it doesn’t get lost in the volume of the space. I think all the elements of this room come together to create a living area I would love to call my own. What do you think? 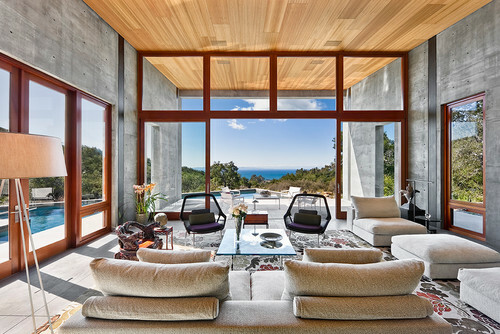 Could you imagine yourself lounging on that sofa, taking in that gorgeous view? Hello there! Please come on in. Allow me to introduce myself. My name is Lisa and I am a student of Interior Design. I am also what you would call an amateur writer. I have never been published nor have I won any awards, but I read and write a lot. Sometimes I think I should have chosen to major in English, but then again, I love Interior Design. It works out really, because the bottom line is that I love to create, whether on paper or in a space. I also love to contemplate beauty, be surrounded by beauty, share beauty. Because of this, I decided to create this blog which would satisfy both urges. In the end, a beautiful space is much like a beautiful poem-it awes, it inspires, it makes you feel something. So, let us get to know each other and contemplate some beauty. I thought we might begin with an entryway which pleases my eyes. I like this entry for various reasons. The high ceilings and white walls make it feel spacious, light, and airy. I understand that when you walk into a house, you should feel as though you are walking into a house, into a shelter from the world and the elements. But I don’t think you should feel as though you are squeezing into a rabbit hole (unless of course you are chasing a white rabbit in which case you might end up somewhere more interesting than just a plain old house). I like that walking into this home might feel like walking on a cloud. I also like the hardwood flooring. 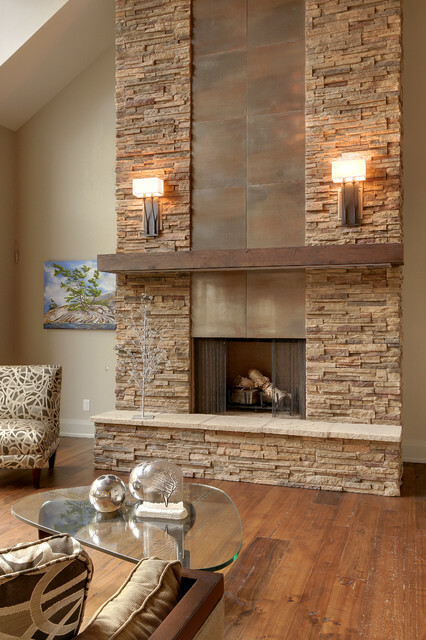 It has a natural feel to it and helps create that nice balance between the rustic and contemporary. The wood beams on the ceiling also add some warmth and keeps the ceiling from flying away. I admit that I am partial to spaces which mix rustic and contemporary elements. I am not a fan of “country” style, but I also don’t like spaces that look like labs. It’s all about balance as they say. The modern door and window are the same minimalist style, trimmed in black which makes them pop against the white walls. The stair rails are also black, as are the legs on the console table. 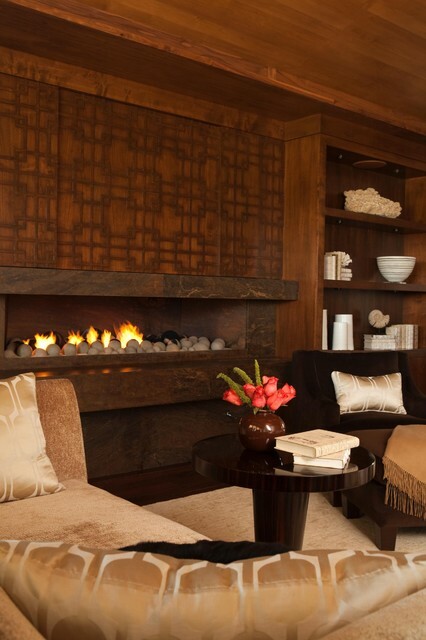 This accentuates these elements and creates a pleasing visual rhythm. And if you look closely, you can see that the door and window seem to frame the tree outside, like two related pieces of art. An added bonus! The empty pot next to the front door is a nice, simple touch. Its organic shape and warm honey color reference nature and serve as counterpoints to all the straight lines in the space. And you can’t go wrong with a simple vase filled with plants or flowers. In this case, tall flowers were an excellent choice, as they fit the scale of the room. I know you’re all probably screaming by now. “What about the climbers?!? !” Haha, yes I had to save the best for last. I love those guys! It’s so unexpected yet fits perfectly in this entryway. Sure, the designer or homeowner could have selected a nice piece of art. But they decided to let loose, have some fun, be bold. And I respect them for that. That’s not to say that these little guys don’t serve as art. They absolutely work as art! They are hung at different heights for visual interest. Their ropes mimic the straight lines found throughout the space. Again, you have a dark color set against the pure white walls. They “pop”, literally and figuratively. I love the unexpected and it only makes me want to explore the rest of the space to find other treasures!